New Year – New Class! We are excited to announce a new strength and running form class to be offered in the New Year by Peak Coaching’s Marshall Pickard! The dreary, dark, cold days of winter is the perfect time to work on runner-specific strength training as well as correcting running form bad habits! Let Marshall help you. 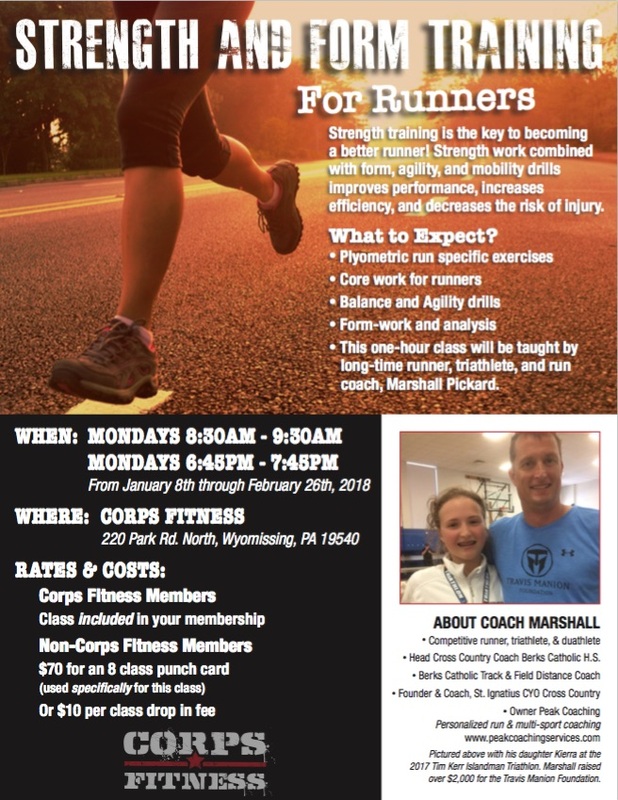 These classes will run for a session of 8 weeks and are available to both Corps Fitness members as well as Non-Members, so invite your running friends! SPECIAL ANNOUNCEMENT FOR DECEMBER 9TH CLASSES! 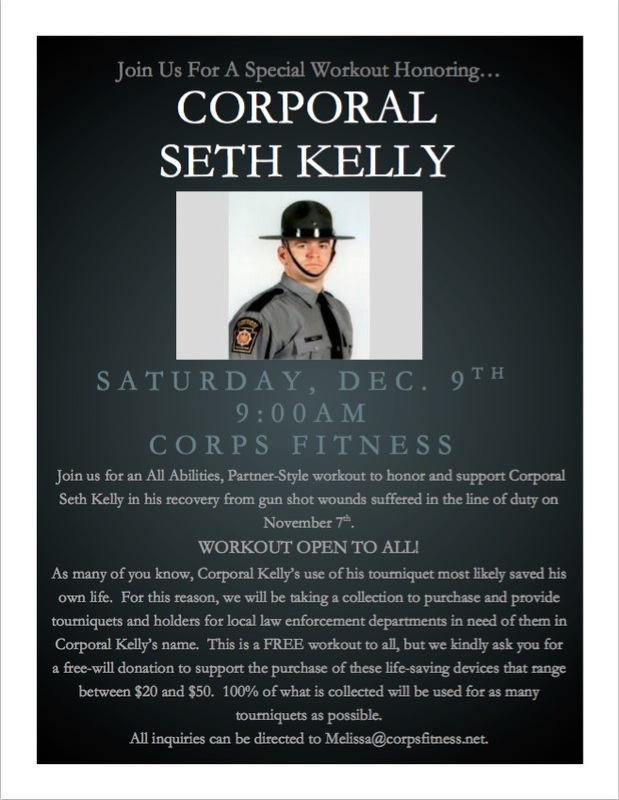 Next Saturday, December 9th, we will be having only ONE workout on this date to honor and support Corporal Seth Kelly who was shot in the line of duty in early November. Corps Fitness is a huge supporter of first responders through our Badge 27 program, and this situation hit home even more so as Corporal Kelly is a cousin of our own Tim McDonough. Please see the flyer attached and spread the word as this workout is All Abilities and open to ALL. It is a partner style workout, so feel free to bring a friend to join you in your workout. As many know, Corporal Kelly’s wherewithal to use his tourniquet most likely saved his own life. Therefore, we’d like to take this workout and event as an opportunity to purchase and provide this life-saving device to law enforcement departments in the area. A collection will be taken at class that day as well as the following week (up to December 15th) to purchase tourniquets and holders in Corporal Kelly’s name. They range in prices from $20 to $50. Please consider giving for this life-saving device….it could make a difference in someone’s life! NOTE: This event is the only class that day, and it is at 9:00AM. Due to this event, there will be NO FREE INTRO class on this date. Instead there will be a free intro this Saturday, December 2nd at 9:30AM. Attention all CF’ers….There are a few changes to this weekends workout schedule. Saturday (9/16) will be normal schedule: 0800 Corps Fitness class followed by the 0915 CrossFit class. Sunday (9/17) we are having an Open Gym starting at 0830 so feel free to come in and get after it! 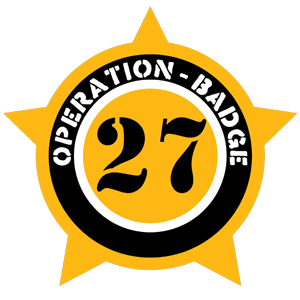 Corps Fitness has been a long-time supporter of all First Responders and is proud to host the Second Annual Call to Action Challenge – Badge 27 Edition. This is a one-of-a-kind challenge for First Responders Teams and Civilian Teams that emphasizes the many mental, tactical and physical challenges First Responders are faced with while on the job. Cost – Cost is $45/person (this is a four person team event). All participating First Responders receive a 15% discount ($38.25/person). Entry fee is non-refundable. Registration – Registration must be remitted in person or by mail to Corps Fitness (220 Park Road North, Wyomissing, PA 19610) along with full team payment amount of $180. Checks made payable to Corps Fitness, cash or credit card are accepted. Registration fees are non-refundable. This is a 4 person team event. Teams may register and participate as a First Responder or a Civilian Team. Within those 2 categories, you may register as an All Male, All Female or Co-Ed team. Kick off of the challenge begins promptly at 8:00AM at the Berks County Fraternal Order of Police Memorial . After the kick off, different teams will begin in waves. Teams will be faced with mental, physical and tactical challenges, many of which represent the tasks First Responders face while on the job. All competitors are invited to join us back at Corps Fitness after the conclusion of the event for a fun After-Party. The After-Party begins at Corps Fitness immediately following finish of last team in challenge. All challenge participants and first responder volunteers will receive a FREE delicious buffet meal courtesy of our sponsor Mission BBQ of Wyomissing. Family and friends are encouraged to join us at the After Party and can pre-order and pre-purchase a buffet ticket on participants registration page or in person at Corps Fitness for a cost of $10. There will be a limited number of extra buffet tickets available the day of challenge; order ahead of time to secure your ticket! Grings Mill will remain open on the day of the challenge, so Teams are asked to be respectful and cognizant of community members who are using the trail and park. Spectators are encouraged to bring bikes and ride along to view all the challenges. Portion of all proceeds from the Challenge will go the Kyle Pagerly Memorial Fund. ***We all know the risks first responders must take while on the job and the dangers they face. Tragically, many of our first responder finest have lost their lives while protecting and serving. We’d like to honor those men and women during our challenge on October 28th. If you know a fallen first responder that you would like honored, please send to melissa@corpsfitness.net, that person’s name, end of watch, and department for which they served. We look forward to a well-attended, well-executed event. But we couldn’t support our First Responders without the help of Volunteers! If you’d like to volunteer your time for this special event, please contact Melissa Hazlett at melissa@corpsfitness.net. We thank you in advance for helping us to make this a spectacular day! Continue to check back to this page often as more details about the event are released. Additional questions can be directed to melissa@corpsfitness.net. Lance Cpl. Bishop of Dickson, Tenn., was a 2002 graduate of Dickson County High School and joined the Marine Corps through the delayed entry program in September 2002. He went on active duty in 2003 and went to Afghanistan right out of boot camp. He was trained as a machine gunner and was promoted to lance corporal in July 2006. He always felt protective of his family and even told them he would protect them. He was the kind that would always come to your rescue. Bishop went through some difficult times personally, but was able to pull through, and afterward “he always found a way to make a bad situation better,” said Sgt. Walter Rattray. On April 29, 2007 during his final patrol mission, Manion made the ultimate sacrifice. His patrol was concluding a search of a suspected insurgent house when it came under precision small arms fire attack. With the corpsman seriously wounded by enemy fire and the attack developing in to a full-scale ambush, Manion and a fellow Marine exposed themselves to increasing fire to pull the corpsman out of the kill zone. After recovering the corpsman and administering first aid, Manion led his patrol in a counter attack personally eliminating an enemy position. As he continued to direct the patrol, another Marine was wounded. He again moved across the kill zone, under fire by five insurgents, to recover the wounded Marine. Iraqi Army reinforcements were halted by an IED and were unable to advance on the flank of the insurgents, leaving Manion and his patrol to take fire from three sides. While fearlessly exposing himself to gain a more advantageous firing position and drawing enemy fire away from the wounded Marines, Manion was fatally wounded by an enemy sniper. His courageous and deliberate actions inspired the eventual counter attack and ultimately saved the lives of every member of his patrol, according to his medal citation. Join us as we remember fallen Marines and pay tribute to our Corps Fitness foundations. Work those overhead movements! We don’t emphasize locking out those arms during OH walking lunges / plate movements for nothing! What did that bag ever do to you? CFers have proven themselves to be competitors in all types of events. We train hard, we compete hard. But training is not the only component….proper fueling and nutrition is too! We are excited to announce a Sports and Performance Nutrition seminar led by Matt Weik of Weik Fitness on Wed. 4/5 at 6:45PM. Available to CF members($20) as well as non-members($25). We are requiring a minimum of 10 pre-paid sign ups to hold this seminar. Additionally, if you have any specific questions you’d like to have addressed as a part of this seminar, you have the opportunity to submit your question in advance to insure that it is covered. IMPORTANT ANNOUNCEMENT: Due to the impending weather, tomorrow’s 5:30AM class is cancelled as is the morning open gym. Please continue to check the Facebook page and/or blog for further announcements regarding class cancellations and gym closures.